Securities offered through Securities America, Inc. Member FINRA/SIPC. Advisory services offered through Securities America Advisors, Inc. 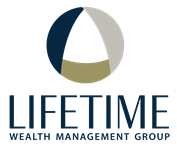 Lifetime Wealth Management and the Securities America companies are separate entities. Securities America and it's representatives do not provide tax or legal advice; therefore it is important to coordinate with your tax or legal advisor regarding your specific situation. This site is published for residents of the United States and is for informational purposes only and does not constitute an offer to sell or a solicitation of an offer to buy any security or product that may be referenced herein. Persons mentioned on this website may only offer services and transact business and/or respond to inquiries in states or jurisdictions in which they have been properly registered or are exempt from registration. Not all products and services referenced on this site are available in every state, jurisdiction or from every person listed.